a) Lamp dark method b) Lamps bright Method. In this method the lamps are arranged as shown in Fig. 1. 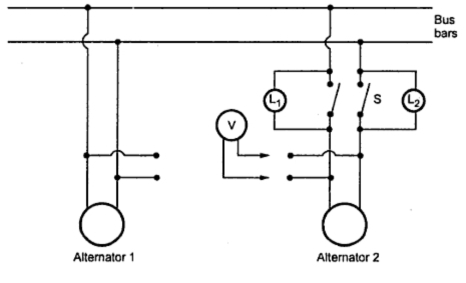 The alternator to be synchronized (which is also called incoming alternator) consists of two lamps connected across the switch terminals of the same phase. The voltage for the two alternators is measured with the help of a voltmeter. The lamps are connected in such a way that the polarity and the frequency for the two machines can be checked. 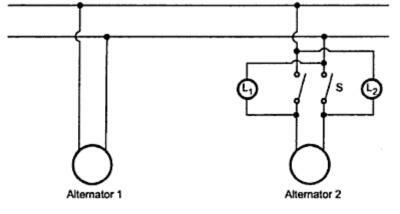 No resultant voltage will appear across the switch terminals if the frequency of the two alternators is exactly same as their voltage are in exact phase opposition. Thus under this case lamps will not glow. The voltages for both the machines are having same maximum and r.m.s. values and are in exact phase opposition thus resultant voltage is zero in local circuit. This is represented in the Fig.2. It can be seen that with unequal frequencies of the two alternators, the two lamps will become alternately bright and dark. The light beat will be produced whose number is equal to the difference in frequencies for the two machines. 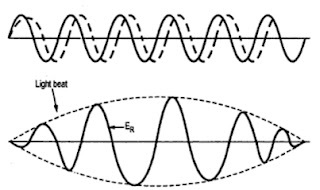 The resultant voltage appearing across the lamp will be difference of the two voltages at any instant resulting in a waveform shown in the Fig. 3. 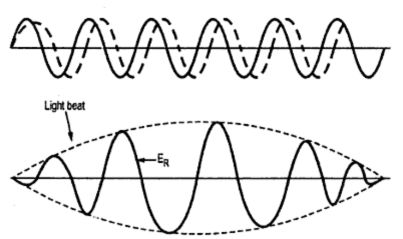 Since number of cycle completed by two machines in any given time are not same the light beat is produced which is shown in the Fig. 3. Whenever the two voltage are in exact phase opposition (i.e. angle between them is 180o) then resultant voltage ER is zero. If the switch is not closed at this instant the voltage across lamp will go on rising and synchronization will not appear proper. The alternate darkness and brightness of the lamp will not indicate whether the incoming alternator is running fast or slow. For the exact synchronization the speed of incoming alternator is adjusted in such a way that the light beats are produced at a very slow speed and the alternators are synchronized during the middle of the dark period where resultant voltage ER will be zero. The word middle is used as the lamp will not glow even though there is sufficient voltage across it. So it becomes difficult to know the correct instant of zero voltage. Since it is very difficult to judge the correct instant of zero voltage in Lamps dark method, this method is introduced which is shown in the Fig. 4. The lamps remain maximum bright when there is no difference in voltages for the two machines. This is more sharp and accurate method of synchronization because the lamps are much more sensitive to changes in voltage at their maximum brightness than when they are dark. Bakshi n Bakshi will be really happy to see an exact copy of the book !